The Nature Walk pattern includes two items: a pullover top (which I described earlier) and this pant, which took its inspiration from a favorite pair of yoga pants that I’ve worn for years. 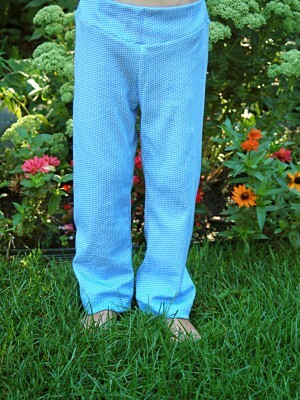 The pants pattern is certainly the fastest pattern to sew that we have ever developed. It has very few seams and, as a result, comes together in no time at all. The pant also includes some fun details to make it special. For starters, the curved yoke at the waist looks very professional, but it’s also functional in that it covers a hidden elastic waistband. Unless you use a knit fabric that includes spandex, typical yoga waistbands without elastic will lose their recovery (which means they fail to bounce back to their original shape) over time. 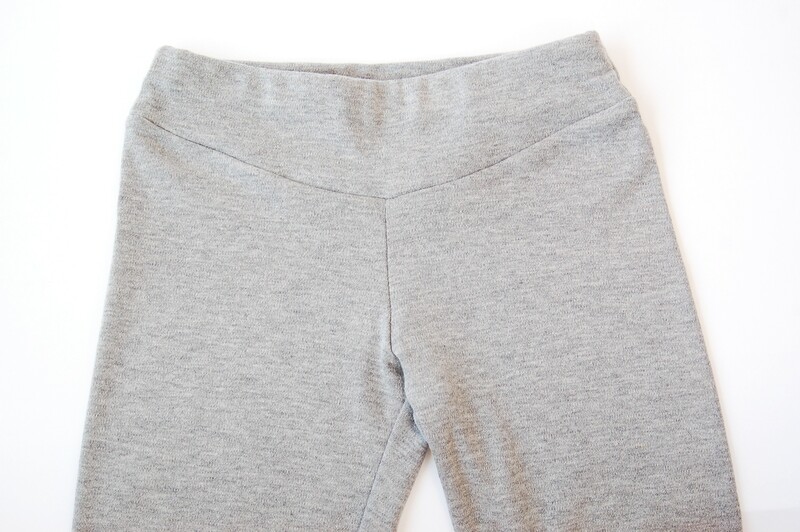 Eventually a yoga pant without elastic at the waistband will grow too wide. The hidden elastic in our pattern will prevent this problem from occurring and will help the pants to stay up. It also makes them comfortable to wear. The pants don’t have a side seam, which makes them even more comfortable. As a result, they could easily be used as a pair of sweatpants or even as a pajama bottom, in addition to being stylish outdoor wear. And have I mentioned how quickly they sew up? Follow our tips for sewing with knit fabrics, and you’ll be able to whip a pair of these pants out in no time at all. And, if you’re willing to do a little customization, the pattern provides you with even more options. I can easily imagine the pattern being shortened and used to make a nice pair of shorts or an adorable pair of capri pants, with a lettuce hem, for a girl. I was actually thinking about a lettuce hem for spring time capris! I love the yoke on the waist; it’s a great detail. I have looked for the above pattern for the nature walk knit pant, I tried fabric.com. Tell me how can I find this?? ?